When we made the first released WordiZ last week, we only included two features : a listing of your top articles (on twitter, google and facebook) and the display of average likes/RTs/+1 of your articles. We are proud to announce that you now have access to a Z-Impact score which is shown on your profile page too. Let me explain a bit more in detail the current information available on your WordiZ profile. The Z-Impact is on a 100 scale. The higher value you get, the more visible your posts and articles are. The calculation is fairly easy at the moment. To give you a brief explanation, if you score is 40, it means that you have at least 40 articles than have been shared on Facebook and Google+ and tweeted at least 40 times. 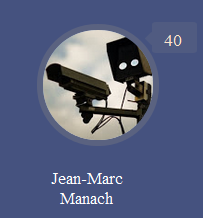 The calculation is easy, Jean-Marc Manach had (at least) 40 x 40 x 3 = 4800 total citations for his best articles. The score will be updated on monthly basis to take into account your last articles, and we will also remove posts older than two years to account for novelty. You see that it does not really reflects the trend of Tom’s blog. However it gives some hindsight when you have many articles so we decided to keep this number on your profile page.